41557 PER2558.JPG 500X638\PER2558.JPG 67808 PER2558_1.jpg 500X638\PER2558_1.jpg 67809 PER2558_2.jpg 500X638\PER2558_2.jpg 86412 PER2558_4.jpg 500X638\PER2558_4.jpg Send A Hint! 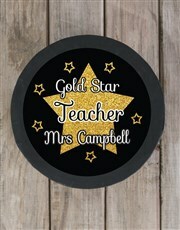 A great teacher deserves a great gift! 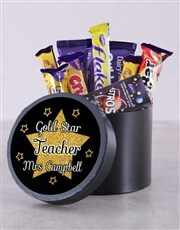 This hat box is branded with a cute 'Gold star teacher' sticker design and is filled with a variety of delicious chocolate treats including Milo Bar (80g), Milky Bar (80g), Aero Milk (85g), Tex (40g), Smarties (70g), Peppermint Crisp (49g), and Bar One (3 x 21g). Send now! 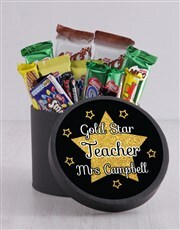 Get this Personalised Gold Star Choc Hat Box delivered with NetFlorist.